In my first box I have Fijian food which you should try, because you don't know - it might be yummy. In my second box I have Anger from Inside Out because he gets angry but he gives people chances. 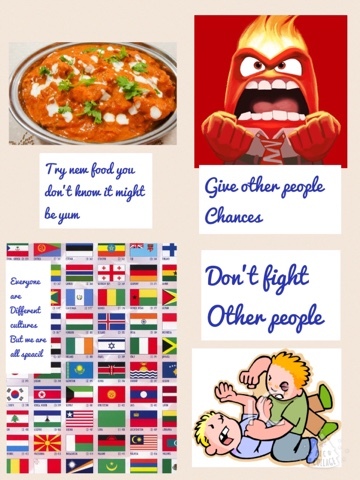 In my third box I have different flags because I think that everyone has different cultures but we are all special and in my last box I have people fighting. It is there to tell other people not to fight. It is also there to tell you "Don't fight in school or else you won't get a good grade."